Blair and Chris Dowden with Huntington University students. In 1991, a 39-year-old Blair Dowden was inaugurated as the 12th president of Huntington College. He brought to the role the experience earned in a wide variety of roles in Christian higher education–from admissions counselor to vice president for advancement. His others-centered approach to leadership made him the man for the job. In his first report to the Board of Trustees, Dowden laid out a vision for making Huntington one of the top Christian colleges in the country. The plan called for “increased integration of Christianity in…all areas of institutional life.” Aggressive enrollment goals were based on the development of distinctive academic programs. The plan included increased financial support and greater public awareness of what Huntington had to offer. This vision was not about building an institution, but rather about equipping students to change the world. After 20 years at the helm, Dowden’s presidency is still characterized by these same hallmarks: faith integration, enrollment growth, academic innovation, philanthropic support, name recognition and a resolute focus on student outcomes. “One of the things I’ve most appreciated about Dr. Dowden is his firm commitment to HU’s emphasis on integrating faith and learning. This is critical to our mission, and he is a strong advocate for it,” said Dr. Dwight Brautigam, professor of history. 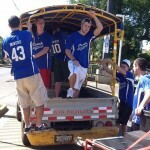 As Huntington continued to emphasize its Christ-centered mission, enrollment grew to 1,278 by 2010. New academic programs were developed for adult students, graduate students and traditional undergraduates. “One thing that has always impressed me about President Dowden is his ability to cultivate a ‘can do’ atmosphere where we as faculty feel empowered to dream big about academic programs,” said associate professor Dr. Lance Clark. “Without his leadership, the digital media arts program would never have seen the light of day. I’m so grateful he was willing to take the risk. Our students are now impacting the world of film and animation in new and exciting ways for the Kingdom of God.” The DMA program now enrolls more than 100 students, comparable to traditionally popular majors in education and business. Despite Huntington’s many successes, Dowden is quick to divert the spotlight from himself to others. For two decades, Dowden has modeled an others-centered approach to leadership. Dr. Chaney Bergdall with students. Preach, teach, minister. The significance of these words constantly resonates with Dr. Chaney Bergdall. 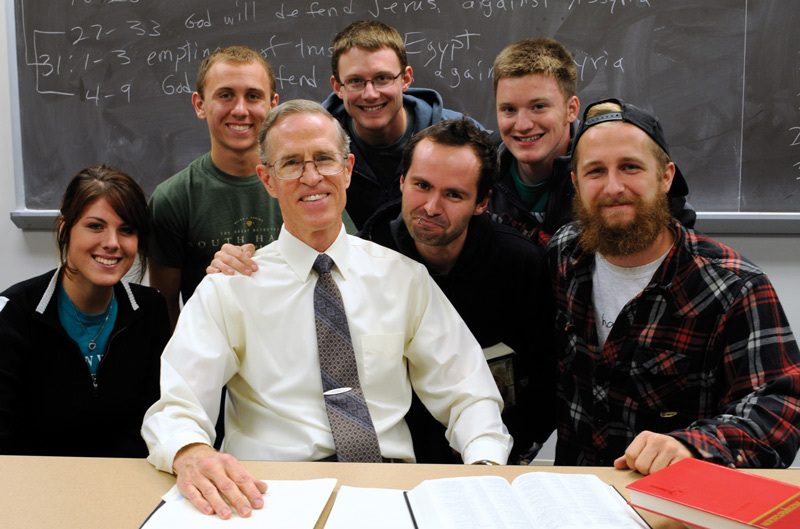 Even though he plans to retire at the end of the school year, he says he will never retire from his life calling — as a teacher and minister of the Gospel. It was 36 years ago when Bergdall joined the faculty. The position fulfilled his lifelong passion to preach and teach. “I saw my coming here as a way that I could give back to the United Brethren Church. It was another way for me to serve which led me to accept the position,” he said. Since arriving in 1975, Bergdall has enjoyed observing what happens in the lives of his students during their college years and will miss the interactions he has with them on a daily basis. “I have fond memories of seeing students grow and watching them latch onto new thoughts about the Bible and the Christian life,” he said. Over his years at HU, Bergdall has taught countless numbers of students — all of them appreciative of the knowledge they have gained under his direction. As a current seminary student, Greg Casserino, a 2011 youth ministry and Bible and religion graduate, more than ever appreciates the constant encouragement he received from Bergdall to dig deeper and to put forth more diligence in his course work during his undergraduate career. Bergdall’s impact has stretched to the faculty, as well. He has become known among his colleagues as a “conscience” in tough times. And as May 12, 2012, approaches, Bergdall remains excited as he starts a new chapter in his life. Once he and his wife, Patricia, get settled in Goshen, Ind., Bergdall hopes to continue being active in some way to give expression to his life calling. According to the student newspaper, the Huntingtonian, the cuts affect 14 staff positions–$250,000 in faculty cuts, and $350,000 in cuts to administrative staff. Other cutbacks don’t involve personnel. All personnel changes will take effect in May 2012, at the end of the academic year. Cassie Screeton sat at her computer looking for companies seeking applicants. It had been a tedious process, and graduation was drawing near. After spending a few hours perusing various websites, Screeton found a not-for-profit organization seeking a graduate intern to assist in donor relations. Three days after her interview, she was offered the position. For the course of the 2011 year, Screeton was all football, all the time. 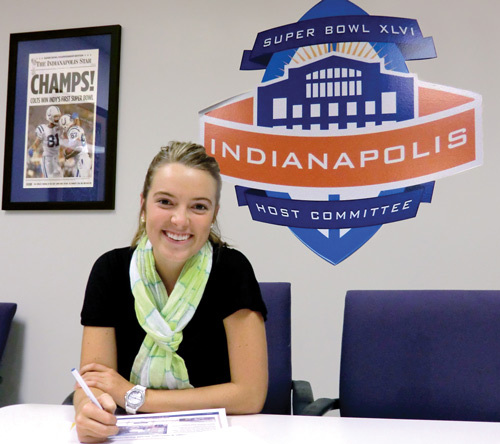 In her position, Screeton, a 2011 economics and finance graduate with a minor in public relations, assists in overseeing 125 donor relationships who pledged to invest money in the 2012 Super Bowl Host Committee in Indianapolis. So far, Screeton has helped to plan and organize a large donor breakfast, has worked with different committees of volunteers, and has written the weekly donor update newsletter. 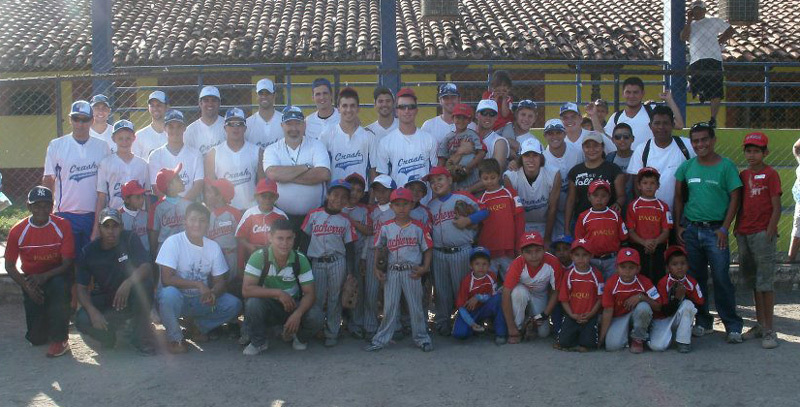 Team members with some of the kids at a clinic. 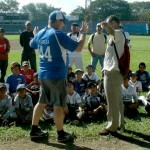 Jeff is a Global Ministries “nontraditional” staffmember serving part of the year in Nicaragua. 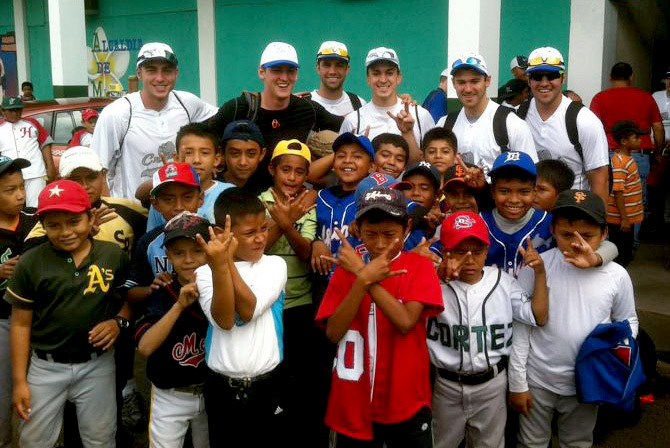 He visited Huntington, Ind., soon after returning from Nicaragua as part of team which, on their Facebook page, described themselves as, “We are a group of men heading to Nicaragua to play baseball and share Jesus with kids.” They did both quite well. Jeff and his son Camden. A friend of Jeff’s who is a coach in Clare, Mich., and his son. 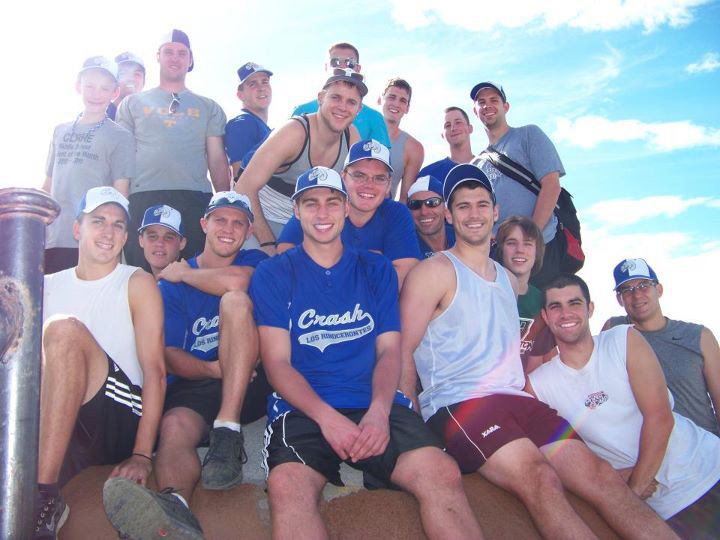 10 baseball players from Huntington University. 2 former baseball players from Anderson University (Anderson, Ind.). One of them, Cody Young, played minor league baseball (shortstop and outfield) for the Baltimore Orioles. Josh Kesler, pastor of The Well in Huntington, Ind. He went along as the team pastor. The team spent a week in Masaya, of city of 130,000 (the country’s third largest) which is the center of our work in Nicaragua. 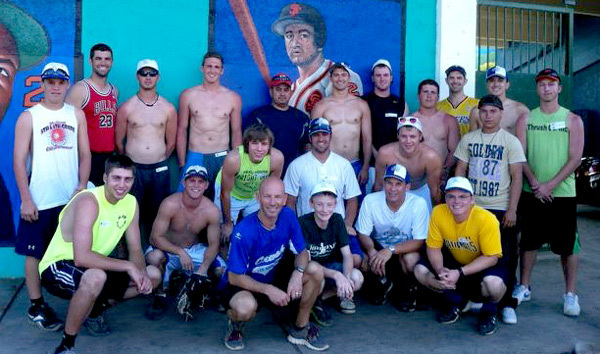 Nicaragua has a four-team winter league, which they would call their professional league. It includes players from many countries. 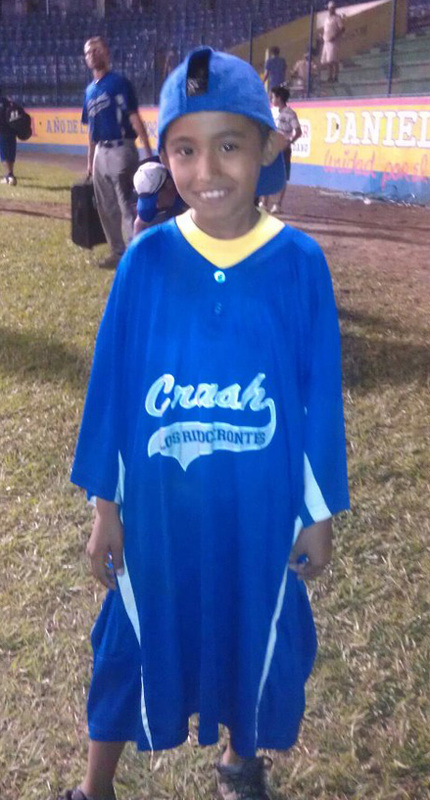 Then in February, 16 teams—all Nicaraguans—begin playing what they call their First Division. The Americans shattered four bats during those first two games. They went to the local bat maker and bought ten more bats. Then they stopped at the local Papa Johns, where they ordered 8 large pizzas and watched the Cincinnati Bengals lose to the Houston Texans. 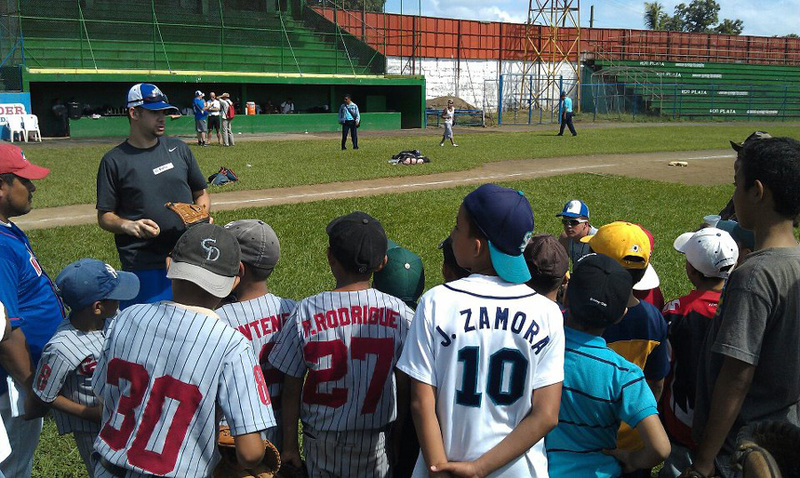 On Monday, January 9, they began a series of baseball clinics which ran every day from 9 am to 12:30 pm, a different age group each day. 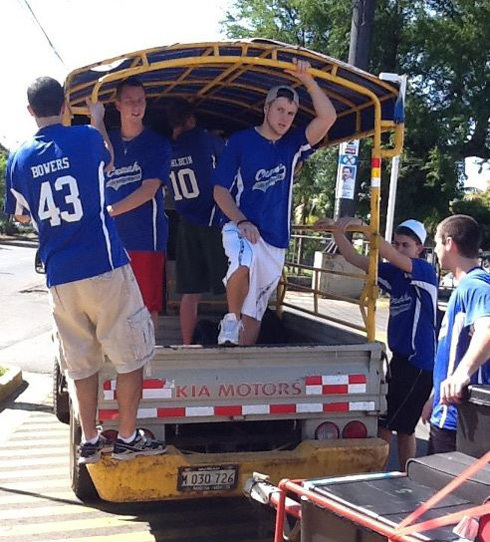 After the clinic they would get some lunch, and then have a few hours before the evening game. 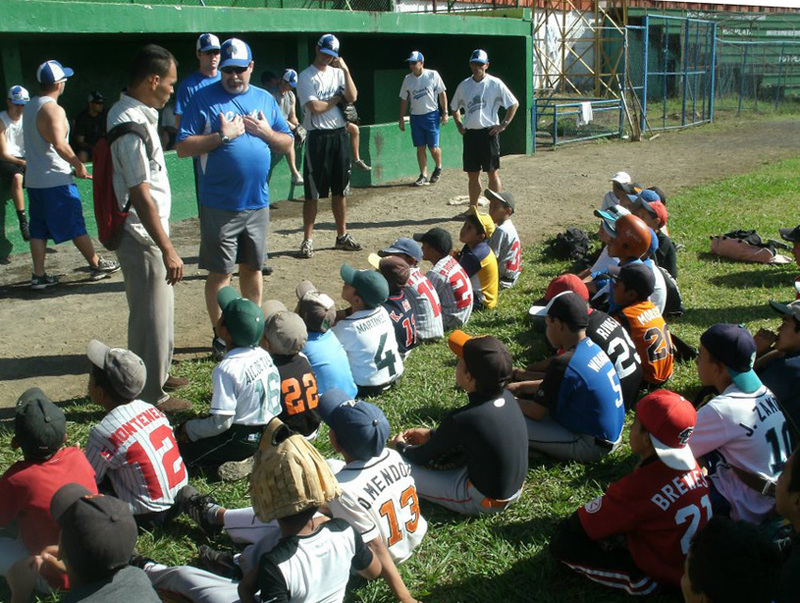 The clinics were conducted in partnership with the Masaya mayor’s office, which contacted local baseball coaches. 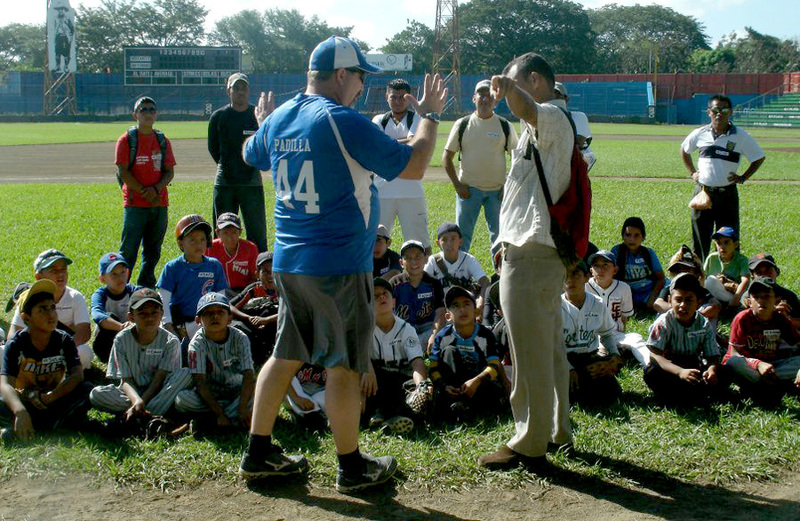 Those coaches then brought their teams to the clinics—an average of 40-50 players each day. 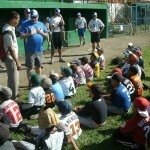 Cody Young giving his testimony to kids at a clinic. 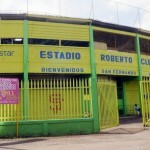 With the mayor’s blessing, they used the city stadium—a very nice stadium–every day for the morning clinics and the evening games. 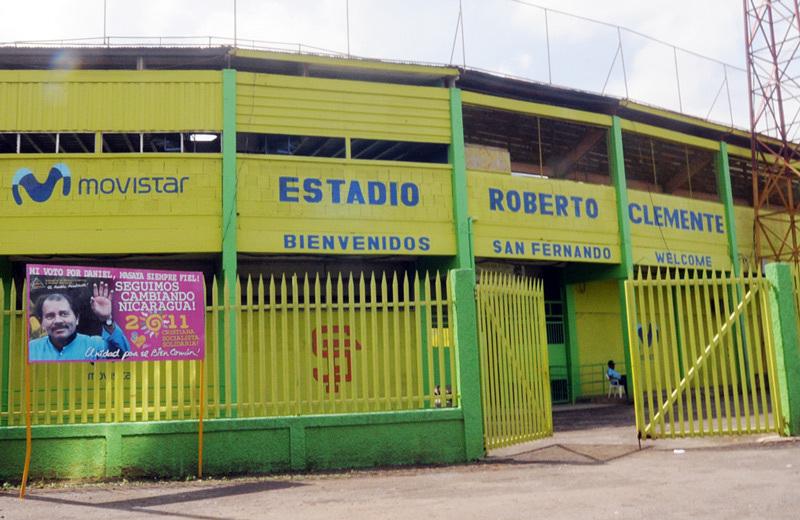 That would be Roberto Clemente Stadium in Masaya, named after the Pittsburgh Pirates star—the first Latin American elected to the Baseball Hall of Fame–who was killed in 1972 in a plane crash while taking relief supplies to earthquake victims in Nicaragua. For the clinics, they employed 10 translators so the players could communicate with the kids. They had six stations at which kids sharpen their skills in specific areas—hitting, pitching, infield defense, outfield defense, bunting, and base running. They spent about 40 minutes at each station. 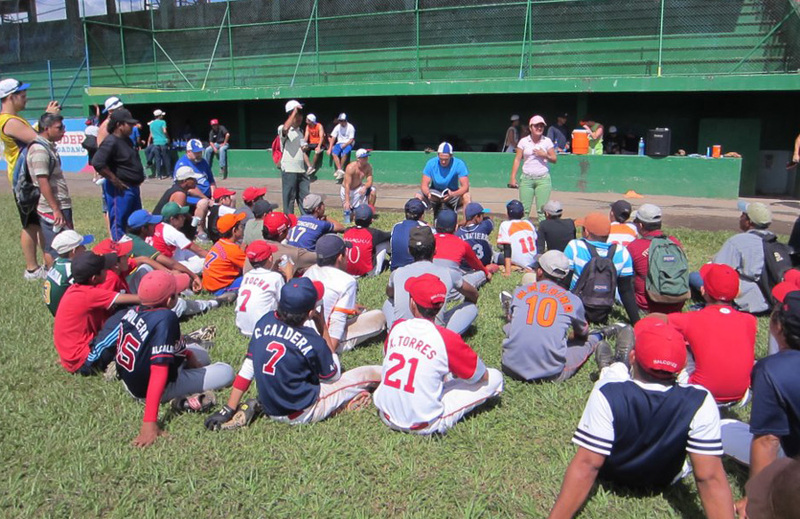 During those clinics, players had a chance to share their testimonies and incorporate the Gospel presentation. Said, a guy who was not a Christian before the clinics, told Jeff Denton he would “see him in heaven.” Pretty neat stuff. They played another double-header on Tuesday night, January 10, again splitting the series. It was a twilight series, beginning at 5 pm with darkness coming around 6 pm. Being short on pitching, they borrowed some pitchers from the opposing team. This kid wanted Drew Adams’ jersey. Ask and receive. Jeff figures about half of the translators stuck around for the games, which enabled the US and Nicaraguan players to communicate. 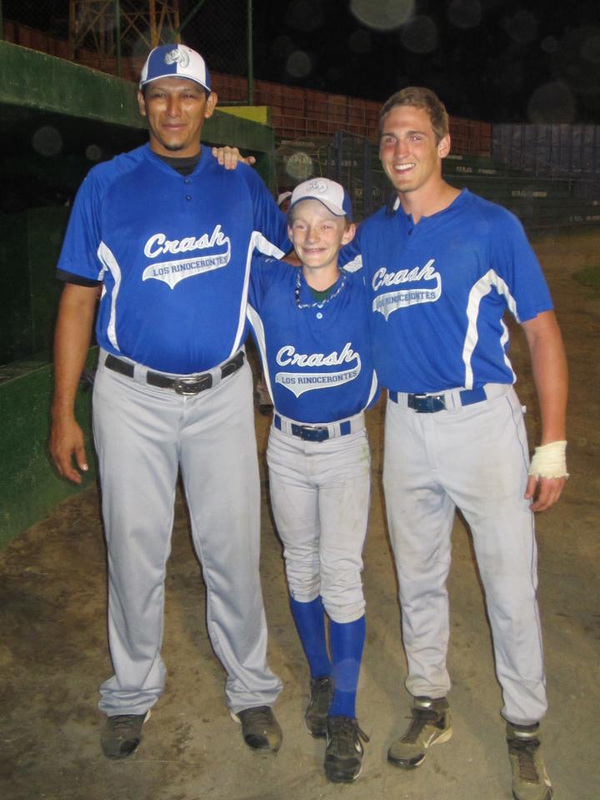 When Derrick McKinney wasn’t pitching, he would go sit on the Nicaraguan bench with a translator. Other players had similar experiences. The rubber match came Saturday, January 15. 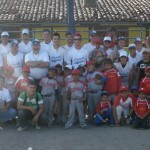 The US team went up 6-0 in the final game, but the Nicaraguans roared back and tied the score. “They said, ‘Can we just quit now?’ So we quit, tied.” Both teams went 3-3-1 for the series. 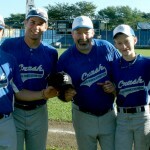 Jeff says, “It was a perfect storm—the combination of playing baseball and sharing Christ. The three soccer guys even got to play a few times on AstroTurf at a private club, which they said was awesome. Team members with kids at one of the clinics. The team in a somewhat more casual moment. Jeff Dice speaking to kids. 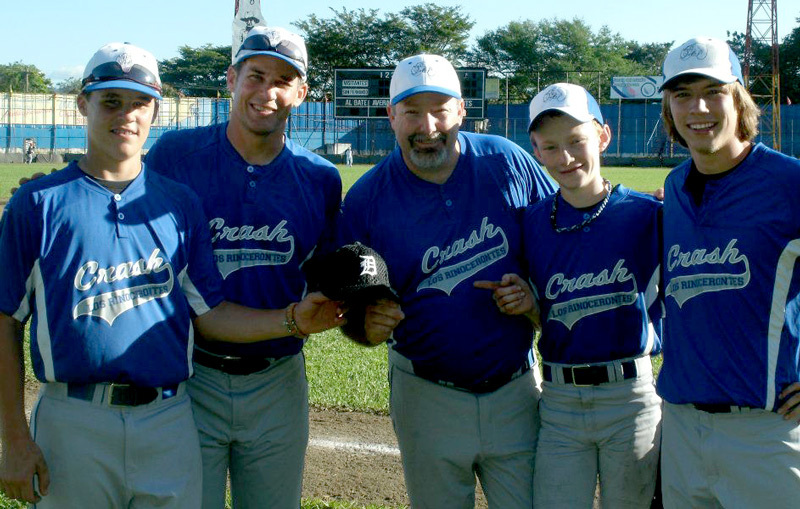 Jeff Dice (center) and son Camden (second from right) with three of the players. Kyle McQuillen (right), Director of Global Ministries 1993-2001, told us previously that he had been diagnosed with cancer of the lymph nodes, and would be undergoing further tests. He sent this update on Monday, January 30. I’ve completed all of my tests, including CAT scans, PET scans, biopsy, chest Xray, blood work, etc. Diagnosis: Grade 1 Follicular Lymphoma, at Stage 3. Grade 1 means it is a non-aggressive, slow-growing cancer, which is very treatable but not curable. Stage 3 indicates that it is in several places–groin, along the spinal column, and under each arm. I will have surgery tomorrow [January 31] to put in a port in my chest through which chemo will be given. Treatment: I’ll begin chemo on February 7. Regiment will be three days and then off for about a month; back for another three days, month off, etc. This should last about 5-6 months. The oncologist is confident that the cancer will be eradicated through this chemo. By the way, this seems to be exactly the same kind of cancer with which Paul Hirschy has been battling for the past 11 years. I’ve spoken to Paul a couple of times via email and phone. All is well with me and I feel great–just not looking forward very much to a chemically changed body due to chemotherapy! You can write to Kyle at: Kyle W. McQuillen, 299 Casa Grande, Edgewater, FL 32141. The Huntington University Board of Trustees approved a modest 2.5% increase in undergraduate tuition and fees for the 2012-13 school year. The tuition cost is well under the 2011 national average of $28,500 for private college education, as determined by the College Board. $348 for all EXCEL Adult Degree programs. $466 for the graduate counseling program. 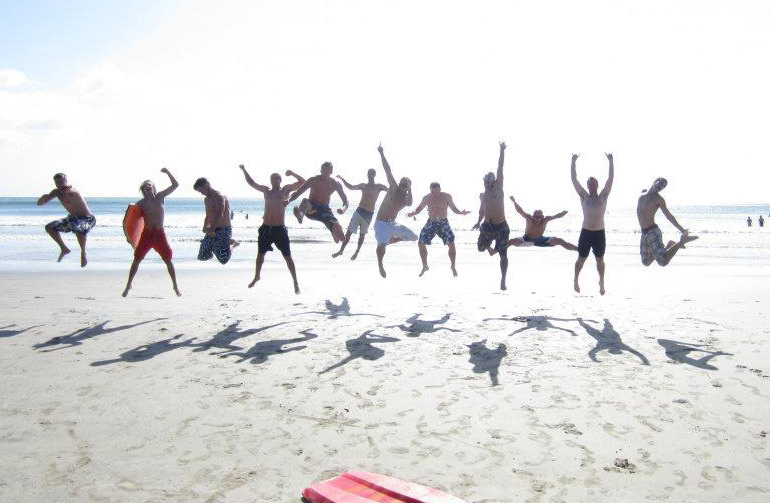 $376 for the graduate youth ministry leadership program. $395 for the graduate education program. Approximately 90 percent of Huntington University students receive financial aid in the form of scholarships, grants, loans, or work-study assistance. All incoming freshmen are also eligible for the loan repayment program which provides assistance to students after they graduate. The loan repayment program covers all or a portion of a student’s loan up to a certain threshold. 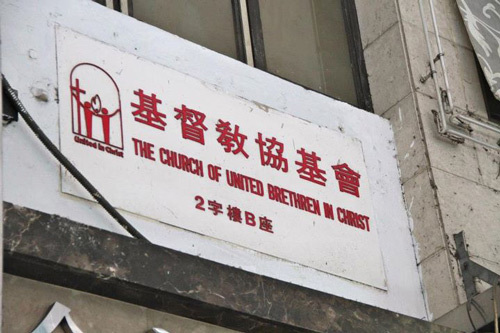 Grace UB church in Hong Kong. While visiting in Thailand and Hong Kong with three leaders from King Street UB in Chambersburg, Pa., we spent time touring some of our UB churches in Hong Kong. I’m not sure what the cost per square foot may be for you where you meet in the United States or Canada, but in Hong Kong the average price per square foot is about $1400 US–the highest in the world. Compare this with an average of $1068 per square foot in Manhattan. 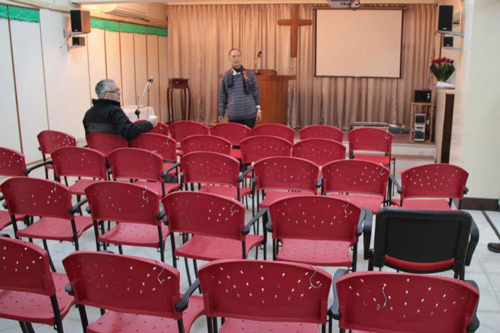 Mark Choi told us that the 60-seat Grace UB church is worth $2,000,000 today. This space is simply a second floor room with no parking or external property and is completely surrounded by other tenants. 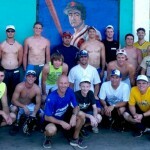 A team from Canada is on its way to Haiti. The first three–Jeff Gordon, Shane FInlay, and Alan Neff–actually arrived on Saturday. The three men hoped to do some repairs around the guest house and to the pastor’s vehicle, and perhaps some work at the Delmas 33 church if time permitted. The rest of the team–five persons–leaves today, January 30. Arek’s sister just called and informed us that Arek’s dad just passed away 15 minutes ago. It happened quite suddenly, as Arek had talked to Dad just the day earlier, so you can imagine it is quite shocking for Arek even though we do expect that can happen any time. We are packing and get ready to travel to Slupsk now. Please remember Arek and his family!